Zoe Saldana , known professionally as Zoe Saldana, is an American actress and dancer. Following her performances with the FACES theater group, Saldana made her screen debut in an episode of Law & Order . Her film career began a year later with Center Stage , where she played a struggling ballet dancer, followed by a role in Crossroads . She first gained some prominence for her role as Anamaria in Pirates of the Caribbean: The Curse of the Black Pearl . As of August 2016, she is the 65th highest-grossing movie star in North America, with her films making over $2.2 billion. 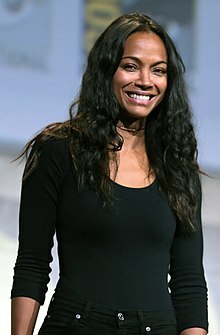 Zoe Saldana (born Zoe Yadira Saldaña Nazario, June 19, 1978), known professionally as Zoe Saldana, is an American actress and dancer. Following her performances with the FACES theater group, Saldana made her screen debut in an episode of Law & Order (1999). Her film career began a year later with Center Stage (2000), where she played a struggling ballet dancer, followed by a role in Crossroads (2002). She first gained some prominence for her role as Anamaria in Pirates of the Caribbean: The Curse of the Black Pearl (2003). As of August 2016, she is the 65th highest-grossing movie star in North America, with her films making over $2.2 billion. Saldana's breakthrough came in 2009 with the roles of Nyota Uhura in Star Trek and Neytiri in James Cameron's Avatar (2009). The latter film received widespread acclaim, and is the highest-grossing film of all time. Saldana continued her successful career with films such as Colombiana (2011), Guardians of the Galaxy (2014) and both Star Trek sequels, Star Trek Into Darkness (2013), and Star Trek Beyond (2016).